And a poem by Damon Lord titled "Cryo-Hell." The new issue's writers are far-flung, with representatives from the US, Canada, the UK, Australia and Singapore, and it is a majority-female group, which pleases me because the previous couple of issues had an extreme gender imbalance in the other direction. I don't apply any sort of gender quota when I select stories, but nor do I want to be one of those male sf editors who seem to always end up with all-male TOCs. I've been actively encouraging submissions from female writers or ones about female protagonists, and I am glad to notice more such items appearing in the in-box. This month's authors include a couple of familiar names to M-Brane readers. Rick Novy has appeared in the zine many times previously, and he guest-edited our twelfth issue, released as a trade paperback titled Ergosphere. 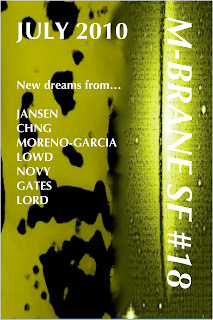 He is also editing a new anthology of near-future sf called 2020 Visions, which M-Brane Press will publish later this year. Patty Jansen, a recent Writers of the Future finalist, appeared in M-Brane last fall and she is also on the staff of Andromeda Spaceways Inflight Magazine. Silvia Moreno-Garcia appeared in our pages a few months ago, and this month offers a science fictional take on vampirism set, like her previous entry, in a future/alternate Mexico (a place that I have come to really like as a location for speculative fiction). Jaym Gates, my co-editor on Little Death of Crossed Genres, appears the first time in M-Brane SF (though she has two entries in the forthcoming The Aether Age). She and Joyce Chng lend a steampunkish flavor to this issue with their highly imaginative tales. 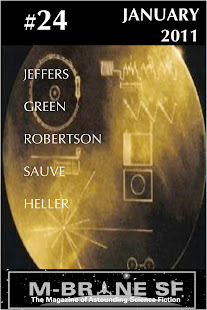 Also new to M-Brane is Mary E. Lowd, offering a story about some unusual brothers and sisters on a distant world. Finally, while I don't believe I have published poetry in M-Brane SF before, I am presenting a science fictional poem by British writer and good friend of M-Brane Damon Lord.